Impeachment in the United States is the process by which the lower house of a legislature brings charges against a civil officer of government for crimes alleged to have been committed, analogous to the bringing of an indictment by a grand jury. At the federal level, this is at the discretion of the House of Representatives. Most impeachments have concerned alleged crimes committed while in office, though there have been a few cases in which officials have been impeached and subsequently convicted for crimes committed prior to taking office. The impeached official remains in office until a trial is held. That trial, and their removal from office if convicted, is separate from the act of impeachment itself. Analogous to a trial before a judge and jury, these proceedings are (where the legislature is bicameral) conducted by upper house of the legislature, which at the federal level is the Senate. Impeachment can also occur at the state level. Each state's legislature can impeach state officials, including the governor, in accordance with their respective state constitution. The number of federal officials impeached by the House of Representatives includes two presidents: Andrew Johnson and Bill Clinton; both were later acquitted by the Senate. Additionally, an impeachment process against Richard Nixon was commenced, but not completed, as he resigned from office before the full House voted on the articles of impeachment. To date, no president has been removed from office by impeachment and conviction. "House Manager" redirects here. For theater operations, see House management. Impeachment proceedings may be commenced by a member of the House of Representatives on his or her own initiative, either by presenting a list of the charges under oath or by asking for referral to the appropriate committee. The impeachment process may be initiated by non-members. For example, when the Judicial Conference of the United States suggests a federal judge be impeached, a charge of actions constituting grounds for impeachment may come from a special prosecutor, the President, or state or territorial legislature, grand jury, or by petition. The type of impeachment resolution determines the committee to which it is referred. A resolution impeaching a particular individual is typically referred to the House Committee on the Judiciary. A resolution to authorize an investigation regarding impeachable conduct is referred to the House Committee on Rules, and then to the Judiciary Committee. The House Committee on the Judiciary, by majority vote, will determine whether grounds for impeachment exist. If the Committee finds grounds for impeachment, it will set forth specific allegations of misconduct in one or more articles of impeachment. The Impeachment Resolution, or Articles of Impeachment, are then reported to the full House with the committee's recommendations. The House debates the resolution and may at the conclusion consider the resolution as a whole or vote on each article of impeachment individually. A simple majority of those present and voting is required for each article for the resolution as a whole to pass. If the House votes to impeach, managers (typically referred to as "House managers", with a "lead House manager") are selected to present the case to the Senate. Recently, managers have been selected by resolution, while historically the House would occasionally elect the managers or pass a resolution allowing the appointment of managers at the discretion of the Speaker of the United States House of Representatives. These managers are roughly the equivalent of the prosecution or district attorney in a standard criminal trial. Also, the House will adopt a resolution in order to notify the Senate of its action. After receiving the notice, the Senate will adopt an order notifying the House that it is ready to receive the managers. The House managers then appear before the bar of the Senate and exhibit the articles of impeachment. After the reading of the charges, the managers return and make a verbal report to the House. Depiction of the impeachment trial of President Andrew Johnson in 1868, Chief Justice Salmon P. Chase presiding. The proceedings unfold in the form of a trial, with each side having the right to call witnesses and perform cross-examinations. The House members, who are given the collective title of managers during the course of the trial, present the prosecution case, and the impeached official has the right to mount a defense with his or her own attorneys as well. Senators must also take an oath or affirmation that they will perform their duties honestly and with due diligence. After hearing the charges, the Senate usually deliberates in private. The Constitution requires a two-thirds super majority to convict a person being impeached. The Senate enters judgment on its decision, whether that be to convict or acquit, and a copy of the judgment is filed with the Secretary of State. Upon conviction in the Senate, the official is automatically removed from office and may also be barred from holding future office. The trial is not an actual criminal proceeding and more closely resembles a civil service termination appeal in terms of the contemplated deprivation. Therefore, the removed official may still be liable to criminal prosecution under a subsequent criminal proceeding. The President may not grant a pardon in the impeachment case, but may in any resulting Federal criminal case. Beginning in the 1980s with Harry E. Claiborne, the Senate began using "Impeachment Trial Committees" pursuant to Senate Rule XI. These committees presided over the evidentiary phase of the trials, hearing the evidence and supervising the examination and cross-examination of witnesses. The committees would then compile the evidentiary record and present it to the Senate; all senators would then have the opportunity to review the evidence before the chamber voted to convict or acquit. The purpose of the committees was to streamline impeachment trials, which otherwise would have taken up a great deal of the chamber's time. Defendants challenged the use of these committees, claiming them to be a violation of their fair trial rights as this did not meet the constitutional requirement for their cases to be "tried by the Senate". Several impeached judges, including District Court Judge Walter Nixon, sought court intervention in their impeachment proceedings on these grounds. In Nixon v. United States (1993), the Supreme Court determined that the federal judiciary could not review such proceedings, as matters related to impeachment trials are political questions and could not be resolved in the courts. In the United Kingdom, impeachment was a procedure whereby a member of the House of Commons could accuse someone of a crime. If the Commons voted for the impeachment, a trial would then be held in the House of Lords. Unlike a bill of attainder, a law declaring a person guilty of a crime, impeachments did not require royal assent, so they could be used to remove troublesome officers of the Crown even if the monarch was trying to protect them. The monarch, however, was above the law and could not be impeached, or indeed judged guilty of any crime. When King Charles I was tried before the Rump Parliament of the New Model Army in 1649 he denied that they had any right to legally indict him, their king, whose power was given by God and the laws of the country, saying: "no earthly power can justly call me (who is your King) in question as a delinquent ... no learned lawyer will affirm that an impeachment can lie against the King." While the House of Commons pronounced him guilty and ordered his execution anyway, the jurisdictional issue tainted the proceedings. With this example in mind, the delegates to the 1787 Constitutional Convention chose to include an impeachment procedure in Article II, Section 4 of the Constitution which could be applied to any government official; they explicitly mentioned the President to ensure there would be no ambiguity. Opinions differed, however, as to the reasons Congress should be able to initiate an impeachment. Initial drafts listed only treason and bribery, but George Mason favored impeachment for "maladministration" (incompetence). James Madison argued that impeachment should only be for criminal behavior, arguing that a maladministration standard would effectively mean that the President would serve at the pleasure of the Senate. Thus the delegates adopted a compromise version allowing impeachment for "treason, bribery and other high crimes and misdemeanors". The precise meaning of the phrase "high crimes and misdemeanors" is somewhat ambiguous; some scholars, such as Kevin Gutzman, argue that it can encompass even non-criminal abuses of power. Whatever its theoretical scope, however, Congress traditionally regards impeachment as a power to use only in extreme cases. The House of Representatives has actually initiated impeachment proceedings 62 times since 1789. Two cases did not come to trial because the individuals had left office. The standard of proof required for impeachment and conviction is also left to the discretion of individual Representatives and Senators, respectively. Defendants have argued that impeachment trials are in the nature of criminal proceedings, with convictions carrying grave consequences for the accused, and that therefore proof beyond a reasonable doubt should be the applicable standard. House Managers have argued that a lower standard would be appropriate to better serve the purpose of defending the community against abuse of power, since the defendant does not risk forfeiture of life, liberty, or property. Actual impeachments of 19 federal officers have taken place. Of these, 15 were federal judges: thirteen district court judges, one court of appeals judge (who also sat on the Commerce Court), and one Supreme Court Associate Justice. Of the other four, two were Presidents, one was a Cabinet secretary, and one was a U.S. Senator. Of the 19 impeached officials, eight were convicted. One, former judge Alcee Hastings, was elected as a member of the United States House of Representatives after being removed from office. The 1797 impeachment of Senator William Blount of Tennessee stalled on the grounds that the Senate lacked jurisdiction over him. No other member of Congress has ever been impeached. The Constitution does give authority to the Senate and House, so that each body may expel its own members. 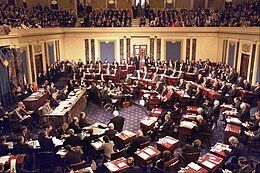 (see List of United States senators expelled or censured and List of United States Representatives expelled, censured, or reprimanded). Expulsion removes the individual from functioning as a representative or senator because of their misbehavior, but unlike impeachment, expulsion cannot result in barring an individual from holding future office. While the actual impeachment of a federal public official is a rare event, demands for impeachment, especially of presidents, are common, going back to the administration of George Washington in the mid-1790s. While almost all of them were for the most part frivolous and were buried as soon as they were introduced, several did have their intended effect. Treasury Secretary Andrew Mellon and Supreme Court Justice Abe Fortas both resigned in response to the threat of impeachment hearings, and, most famously, President Richard Nixon resigned from office after the House Judiciary Committee had already reported articles of impeachment to the floor. State legislatures can impeach state officials, including governors, in every State except Oregon. The court for the trial of impeachments may differ somewhat from the federal model—in New York, for instance, the Assembly (lower house) impeaches, and the State Senate tries the case, but the members of the seven-judge New York State Court of Appeals (the state's highest, constitutional court) sit with the senators as jurors as well. Impeachment and removal of governors has happened occasionally throughout the history of the United States, usually for corruption charges. A total of at least eleven U.S. state governors have faced an impeachment trial; a twelfth, Governor Lee Cruce of Oklahoma, escaped impeachment conviction by a single vote in 1912. Several others, most recently Missouri's Eric Greitens, have resigned rather than face impeachment, when events seemed to make it inevitable. The most recent impeachment of a state governor occurred on January 14, 2009, when the Illinois House of Representatives voted 117–1 to impeach Rod Blagojevich on corruption charges; he was subsequently removed from office and barred from holding future office by the Illinois Senate on January 29. He was the eighth U.S. state governor to be removed from office. The procedure for impeachment, or removal, of local officials varies widely. For instance, in New York a mayor is removed directly by the governor "upon being heard" on charges—the law makes no further specification of what charges are necessary or what the governor must find in order to remove a mayor. In 2018, the entire Supreme Court of Appeals of West Virginia was impeached, something that has been often threatened, but had never happened before. August 13, 2018 Robin Davis Associate Justice, Supreme Court of Appeals of West Virginia Retired on August 13, 2018. Despite her retirement, the West Virginia Senate refused to dismiss the articles of impeachment and scheduled trial for October 29, 2018 although the trial is currently delayed by court order. Allen Loughry Resigned on November 12, 2018. Possible trial before the West Virginia Senate delayed by court order. Beth Walker Reprimanded and censured on October 2, 2018, not removed from office. Margaret Workman Chief Justice, Supreme Court of Appeals of West Virginia Trial before the West Virginia Senate delayed by court order after originally being scheduled for October 15, 2018. ^ "Removed and disqualified" indicates that following conviction the Senate voted to disqualify the individual from holding further federal office pursuant to Article I, Section 3 of the United States Constitution, which provides, in pertinent part, that "[j]udgment in cases of impeachment shall not extend further than to removal from office, and disqualification to hold and enjoy any office of honor, trust or profit under the United States." ^ During the impeachment trial of Senator Blount, it was argued that the House of Representatives did not have the power to impeach members of either House of Congress; though the Senate never explicitly ruled on this argument, the House has never again impeached a member of Congress. The Constitution allows either House to expel one of its members by a two-thirds vote, which the Senate had done to Blount on the same day the House impeached him (but before the Senate heard the case). ^ Judge Nixon later challenged the validity of his removal from office on procedural grounds; the challenge was ultimately rejected as nonjusticiable by the Supreme Court in Nixon v. United States, 506 U.S. 224 (1993). ^ Cole, J.P.; Garvey, T. (October 29, 2015). "Impeachment and Removal" (PDF). Federation of American Scientists. Congressional Research Service. pp. 15–16. Retrieved 22 September 2016. ^ a b c Presser, Stephen B. "Essays on Article I: Impeachment". The Heritage Guide to the Constitution. Heritage Foundation. Retrieved June 14, 2018. ^ "What would Trump have to do to get impeached?". whatifhq.com. Retrieved 2018-08-26. ^ a b "Rules and Procedures of Practice in the Senate When Sitting on Impeachment Trials" (PDF). Senate Manual Containing the Standing Rules, Orders, Laws and Resolutions Affecting the Business of the United States Senate, Section 100–126, 105th Congress, pp. 177–185. United States Senate. August 16, 1986. Retrieved June 14, 2018. ^ Gerhardt, Michael J. "Essays on Article I: Punishment for Impeachment". The Heritage Guide to the Constitution. Heritage Foundation. Retrieved June 14, 2018. ^ "Welcome to The American Presidency". Archived from the original on 2007-09-30. Retrieved 2007-04-20. ^ Ripy, Thomas B. "Standard of Proof in Senate Impeachment Proceedings". Congressional Research Service. ^ a b c d e f g h i j k l m n o p q r s t u v w x y z aa ab ac ad "Impeachments of Federal Judges". Federal Judicial Center. Retrieved 2017-05-16. ^ "1801: Senate Tries Supreme Court Justice". November 25, 2014. ^ a b "Judges of the United States Courts – Delahay, Mark W." Federal Judicial Center. Retrieved 2009-06-20. ^ "Hinds' Precedents, Volume 3 – Chapter 78 – The Impeachment and Trial of Charles Swayne". ^ Erskine, Daniel H (2008). "The Trial of Queen Caroline and the Impeachment of President Clinton: Law As a Weapon for Political Reform". Washington University Global Studies Law Review. Washington University in St. Louis. Archived from the original on March 27, 2019. Retrieved April 8, 2019. ^ Alpert, Bruce; Tilove, Jonathan (2010-12-08). "Senate votes to remove Judge Thomas Porteous from office". New Orleans Times-Picayune. Retrieved 2010-12-08. ^ Alpert, Bruce (2010-03-11). "Judge Thomas Porteous impeached by U.S. House of Representatives". New Orleans Times-Picayune. Retrieved 2010-03-11. ^ Clark, Richard C. (2008-07-22). "McFadden's Attempts to Abortababy the Federal Reserve System". Scribd. Archived from the original on 2010-03-02. Retrieved 2009-06-20. Though a Republican, he moved to impeach President Herbert Hoover in 1932 and introduced a resolution to bring conspiracy charges against the Board of Governors of the Federal Reserve. ^ "National Affairs: Texan, Texan & Texan". Time. January 25, 1932. Retrieved May 5, 2010. ^ Suntrup, Jack; Erickson, Kurt. "Embattled Gov. Eric Greitens resigns". St. Louis Post-Dispatch. ^ "House votes to impeach Blagojevich again". Chicago Tribune. 2009-01-14. Retrieved 2009-01-14. ^ Bateman, Newton; Selby, Paul; Shonkwiler, Frances M.; Fowkes, Henry L. (1908). Historical Encyclopedia of Illinois. Chicago, IL: Munsell Publishing Company. p. 489. ^ a b c "Impeachment of State Officials". Cga.ct.gov. Retrieved 2008-09-06. ^ a b Blackmar, Frank (1912). Kansas: A Cyclopedia of State History. Standard Publishing Co. p. 598. ^ "Letters Relating to the Efforts to Impeach Governor Harrison Reed During the Reconstruction Era". floridamemory.com. Archived from the original on 2016-05-29. Retrieved 2016-11-04. ^ "State Governors of Louisiana: Henry Clay Warmoth". Enlou.com. Archived from the original on 2008-04-06. Retrieved 2008-09-06. ^ Block, Lourenda (2000). "Permanent University Fund: Investing in the Future of Texas". TxTell (University of Texas at Austin). Archived from the original on 2009-02-04. Retrieved 2009-02-14. ^ "Raulston Schoolfield, Impeached Judge, Dies". UPI. October 8, 1982. Retrieved 2016-01-27. ^ "Impeachment Trial Finds Judge Guilty". AP. July 11, 1958. Retrieved 2016-01-27. ^ "Attorney General is Impeached". AP. 1984-03-14. Retrieved 2012-10-11. ^ "Nebraskan Found Not Guilty". AP. 1984-05-04. Retrieved 2012-10-11. ^ Gruson, Lindsey (1988-02-06). "House Impeaches Arizona Governor". The New York Times. Retrieved 2009-07-02. ^ Gruson, Lindsey (1988-04-05). "Arizona's Senate Ousts Governor, Voting Him Guilty of Misconduct". The New York Times. Retrieved 2009-07-02. ^ AP staff reporter (1989-03-30). "Impeachment in West Virginia". The New York Times. Retrieved 2009-10-17. ^ Wallace, Anise C. (1989-07-10). "Treasurer of West Virginia Retires Over Fund's Losses". The New York Times. Retrieved 2009-10-17. ^ "Kentucky House Votes To Impeach Jailed Official". Orlando Sentinel. 1991-01-26. Retrieved 2015-11-16. The House voted unanimously Friday to impeach the agriculture commissioner six days after he began serving a one-year sentence for a payroll violation. ^ "Jailed Official Resigns Before Impeachment Trial". Orlando Sentinel. 1991-02-07. Retrieved 2015-11-16. Kentucky's commissioner of agriculture, serving a one-year jail sentence for felony theft, resigned Wednesday hours before his impeachment trial was scheduled to begin in the state Senate. ^ Hinds, Michael deCourcy (1994-05-25). "Pennsylvania House Votes To Impeach a State Justice". The New York Times. Retrieved 2010-01-24. A State Supreme Court justice convicted on drug charges was impeached today by the Pennsylvania House of Representatives. ^ Moushey, Bill; Tim Reeves (1994-10-05). "Larsen Removed Senate Convicts Judge On 1 Charge". Pittsburgh Post-Gazette. Pittsburgh, PA. p. A1. Retrieved 2013-09-14. Rolf Larsen yesterday became the first justice of the Pennsylvania Supreme Court to be removed from office through impeachment. The state Senate, after six hours of debate, found Larsen guilty of one of seven articles of impeachment at about 8:25 p.m, then unanimously voted to remove him permanently from office and bar him from ever seeking an elected position again. ^ Young, Virginia (1994-10-07). "Moriarty Is Impeached – Secretary Of State Will Fight Removal". St. Louis Post-Dispatch. St. Louis, MO. p. 1A. Retrieved 2013-09-14. The House voted overwhelmingly Thursday to impeach Secretary of State Judith K. Moriarty for misconduct that "breached the public trust". The move, the first impeachment in Missouri in 26 years, came at 4:25 p.m. in a hushed House chamber. ^ Young, Virginia; Bell, Kim (1994-12-13). "High Court Ousts Moriarty". St. Louis Post-Dispatch. St. Louis, MO. p. 1A. Retrieved 2013-09-14. In a unanimous opinion Monday, the Missouri Supreme Court convicted Secretary of State Judith K. Moriarty of misconduct and removed her from office. ^ Vogel, Ed (2004-11-12). "Augustine impeached". Review-Journal. Retrieved 2009-07-02. ^ Whaley, Sean (2004-12-05). "Senate lets controller keep job". Review-Journal. Retrieved 2009-07-02. ^ Jenkins, Nate (2006-04-11). "Hergert impeached". Lincoln Journal Star. Retrieved 2012-10-11. With the last vote and by the slimmest of margins, the Legislature did to University of Nebraska Regent David Hergert Wednesday what it hadn't done in 22 years—move to unseat an elected official. ^ "Hergert Convicted". WOWT-TV. 2006-08-08. Archived from the original on 2013-01-15. Retrieved 2012-10-11. University of Nebraska Regent David Hergert was convicted Friday of manipulating campaign-finance laws during his 2004 campaign and then lying to cover it up. The state Supreme Court ruling immediately removed Hergert, 66, from office. ^ Staff reporter (2009-01-09). "Illinois House impeaches Gov. Rod Blagojevich". AP. Retrieved 2009-07-02. ^ Mckinney, Dave; Wilson, Jordan (2009-01-14). "Illinois House impeaches Gov. Rod Blagojevich". Chicago Sun-Times. Archived from the original on 2009-02-01. Retrieved 2009-07-02. ^ Long, Ray; Rick Pearson (2009-01-30). "Blagojevich is removed from office". Los Angeles Times. Retrieved 2009-06-21. ^ Eugenio, Haidee V. (2009-01-09). "CNMI governor impeached on 13 charges". Saipan Tribune. Retrieved 2013-09-14. ^ "The Latest: All 4 West Virginia justices impeached". Herald-Dispatch. Associated Press. 2018-08-13. Retrieved 2018-08-14. ^ "WV Supreme Court Justice Robin Davis retires after her impeachment". Herald-Dispatch. Associated Press. 2018-08-14. Retrieved 2018-08-14. ^ "The Latest: W.Va. lawmakers won't meet after justice resigns". Associated Press. November 11, 2018. ^ Allen Adams, Steven (November 12, 2018). "Facing Possible Impeachment, West Virginia Supreme Court Justice Resigns". Governing. ^ MetroNews, WSAZ News Staff, WV. "Senators reprimand Justice Walker, but vote to not impeach". www.wsaz.com. Retrieved 2019-03-01. ^ writer, Phil Kabler Staff. "With Workman impeachment trial blocked, Senate debates next move". Charleston Gazette-Mail. Retrieved 2019-03-01. ^ MORRIS, JEFF (2018-10-11). "West Virginia Supreme Court halts impeachment trial for Justice Workman". WCHS. Retrieved 2019-03-01. Berger, Raoul (1999). Impeachment: The Constitutional Problems. Harvard University Press. ISBN 9780674444782. Black, Charles L. (1998). Impeachment: A Handbook. Yale University Press. ISBN 9780300079500. Sunstein, Cass R. (2017). Impeachment: A Citizen's Guide. Harvard University Press. ISBN 9780674983793. Wikimedia Commons has media related to Impeachment in the United States. This page was last edited on 20 April 2019, at 10:26 (UTC).